I heard from a favorite client of mine recently. He wanted 2 shirts made, and luckily I still had the fabric he wanted in stock. This very stylish man always has design details in mind, and was quite specific about what he wanted....but as always, left the "fine" details up to me. My client wanted this blue shirt styled to be worn "tucked in". When drafting the pattern, I lengthened the shirt-tails so that when he moved his arms, the shirt would stay tucked. 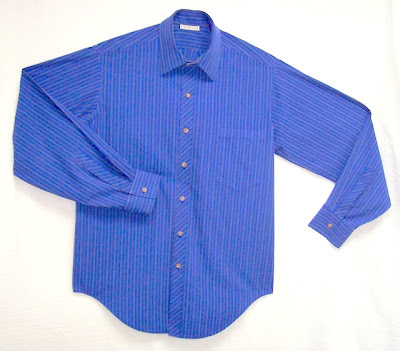 The drape of this royal blue Swiss cotton is extraordinary, so instead of drafting the sleeves "straight", I bowed (curved) them out slightly to produce a subtle soft drape when worn. Other design details include bias front button stand and bias sleeve plackets. This Band Collar shirt is made from fabric that is more crisp than the blue shirt above. The characteristics of the fabric dictated my design choices. This shirt is cut with what I call "straight line" details. 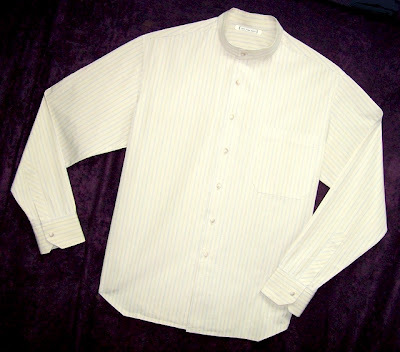 The sleeves are straight cut, rather than curved like the shirt above, and the sleeve cuffs are angled, as is the "spade" hem. Sewing Notes: ProWoven Fusible Interfacing used on the blue shirt, ProWeft Fusible Interfacing used on the cream shirt.